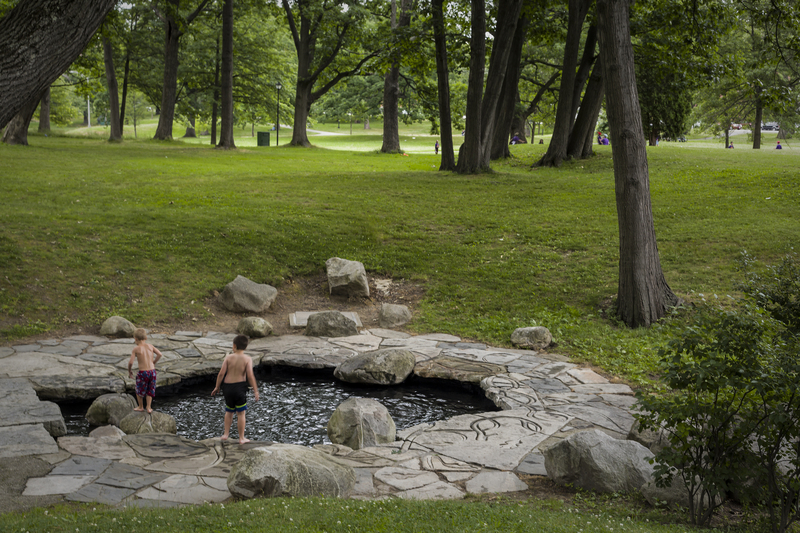 The Circle of Life, a sculpture by Maine artist Carole Hanson, was conceived as an expression of beauty, of the spirit of Deering Oaks Park and of human endeavor. 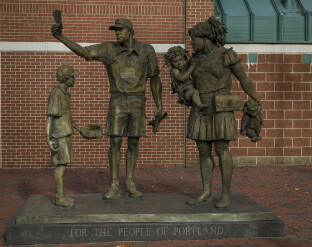 It commemorates the life of Kay Wagenknecht-Harte, her own quest for beauty and order, and her love for the City of Portland. Kay was Portland’s beloved Urban Designer and supporter of the arts. 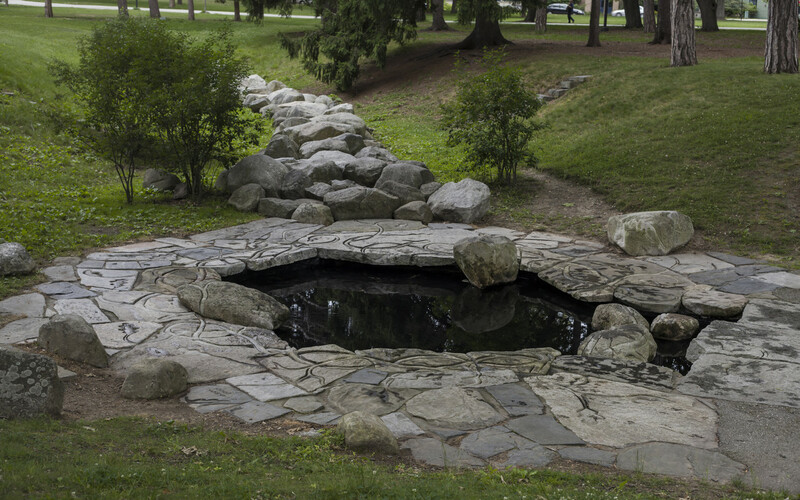 Kay’s untimely death inspired her many friends and supporters to propose, in her memory, renovation of the Ravine in Deering Oaks, a tumbledown, forgotten piece of the park originally envisioned by engineer William Goodwin as one of the park’s major visual elements. 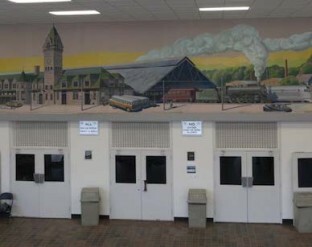 Plans to create new stonework, pathways, waterworks and reflecting pool for the enjoyment of the community included artwork at the center of the project. 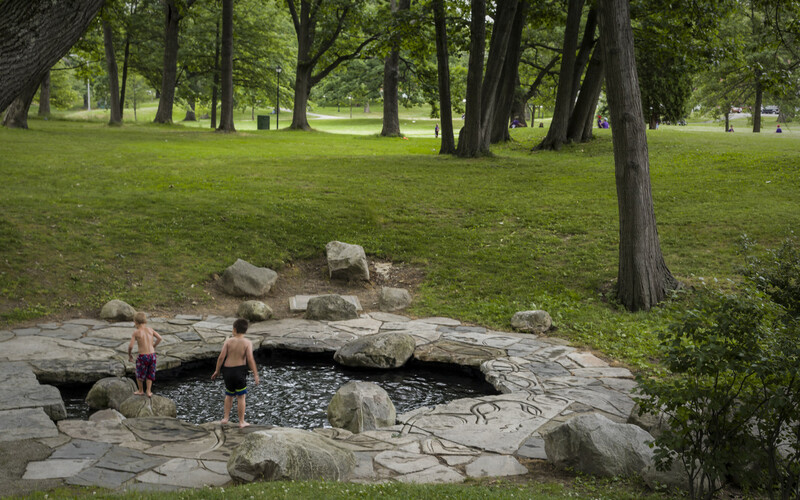 Portland Parks and Recreation, the Friends of Deering Oaks (Anne Pringle, Chair), and the Portland Public Art Committee, facilitated the project, and the Friends of Deering Oaks funded it. 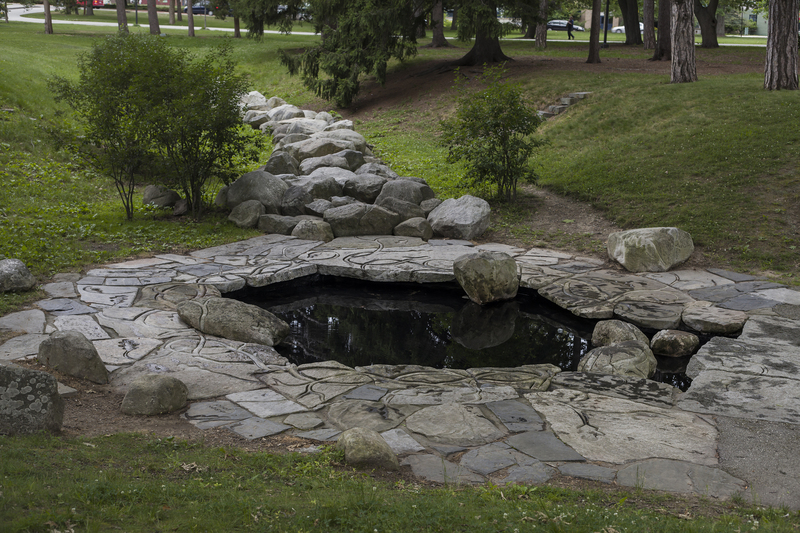 Landscape Architect Stephen Mohr was the lead designer. The Circle of Life is a carving of large paving stones surrounding the reflecting pool. It is a network of oak branches and leaves that suggest a natural wreath meandering in and out over the stones. It speaks for the striving and glories of everyday life. 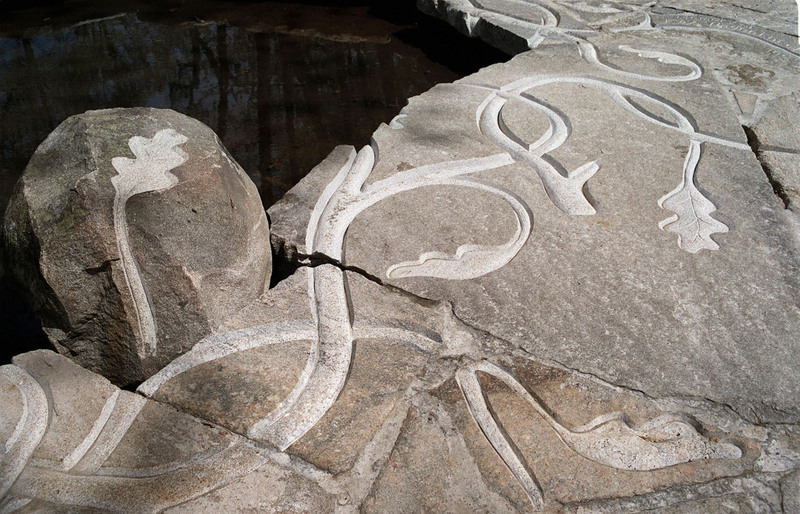 The sculpture was to begin in the early fall of 1999, but because of complications, Hanson was not given access to work until November. By then, winter’s chill was settling over the park. With the help of the parks crew, she worked through the snows, having to clear and restart, and often stop work altogether because of the cold. The parks crew was especially helpful during this arduous process, transporting and storing her heavy equipment. 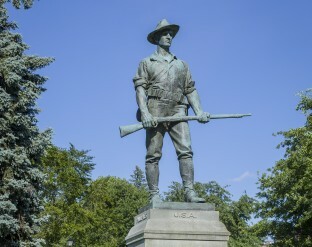 Finally, the sculpture was completed and inaugurated in May of 2000. There was a celebratory performance of dance and music for the event–improvisational artist Debi Irons danced on the stones, while the Mark Kleinhaut Trio and Hanson, as jazz vocalist, provided the music. Carole Hanson, Sculptor. Stephen Mohr, Landscape Architect.